How To Build A Tube Amp, or Burn down A house.. Phase 1 the Research. so what I have so far is a list of schematic sites. So need to actually find on that is like, and move on to the next part..
Now Ideally I would Like to Scratch Build this, but it has been Suggested I look for a donor amp to start with. Awesome, looking forward to watching this one! Donor amp worked well for me. It gave me the chassis, transformers and tube sockets, plus I got the rectifier and power tubes thrown in for the price. I would say it let me get started quickly but stripping it took forever so I'm not so sure. That said, you can source all the parts separately so doing it from scratch is certainly an option. My advice is first to decide what type of amp you want to build and then focus your research around that and ultimately select/design your schematic. If you do get a donor amp then that may dictate some of your choices, particularly around the power section, but you still have some flexibility. For me the choice was between a plexi copy and a fender blackface copy... I opted for the latter because I wanted more clean tone and it works really well for me but I'm going to be adding a plexi channel soon. https://www.youtube.com/channel/UCuR4hQTXkG_KxozLxwPzEjQ - Treasure trove of information and amp build/restoration videos. His dry style may not be for everyone but I can't get enough. He doesn't have proper play lists set up but scrape through his videos and you'll find his theory videos around 3 or 4 years ago. This is where I started. https://www.trxe.com/ - Online electronics shop. They do bulk purchasing from Mouser so are a good place to get the harder to source items like transformers. https://www.facebook.com/groups/savalve/ - Local amp builders group, not very active but enthusiastic and helpful. It's a good place to get advice and to look for second hand goods. One last note. You'll want to get yourself a decent speaker if you don't have one already, it will absolutely bring your amp to life. If you have the ability to build a combo that's awesome, if you're just building the head then it may be easiest to buy a second hand cab. So what do i want out of my Amp Clean sound, with good ability for future pedals. this will be a complete design.. I.e cab and head or combo..
OK... So after having some discussions, pondering and deep thought, and some YouTube sampling, I have Narrowed the choice down..so we doing an 7 valve amp....... an have managed to source the most of elusive items, the transformers, and boy do i now know more about transformers than i ever thought id ever need to know. thanks Yeti for those links, Uncle Doug's YouTube channel is a wealth of info, just waiting on a book order i have for designing valve amps, for some light reading. stack gives me the ability to really show off the valves.. combo means less hassle transporting storing etc. Ah, yes. Many routes. So many choices. So much information. Have fun. Welcome to the club. It is well worth the effort! Sounds like you are making some progress, do you have a circuit diagram for us to check out? Out of interest, what transformers are you getting and where are you getting them? Regarding price... no, this certainly isn't a cheap way of getting an amp. Some of these components are very specialised and correspondingly expensive. For me it was far more about having a project to work on... and the fact that it's easier (for me) to get project expenses past my wife than purchases. Although, having a completed build that sounds great is a fantastic feeling. agreed, I need to have something creative to keep me busy.. The main signal path is very similar circuit to mine except that mine doesn't have the third preamp stage and has a long tail inverter instead. That power tube bias tremolo looks really cool too. Are you planning to build the reverb and tremolo? If there is one mod I'd definitely recommend it's the master volume. Push/Pull 6v6s are plenty loud and you'll battle to get anything other than clean tones at home volume without one. I went with a Post Phase Inverter MV for mine because of the inverter but with the cathodyne phase inverter I think you can get away with the simpler pre-phase inverter. I'm sure that Rob Rob has plenty to say on the subject. Quick question, I was originally going to go for something like a 1/4 power switch or 10% power-switch for bedroom playing, is the Master volume better? Awesome, looking forward to watching this build. Out of interest, where are planning to get your reverb tank? So I put in the master volume And a switchable attenuator. Attenuator has 3 levels, -3, -6 and -10. I didn't use his exact design but it's the same idea... And honestly I'm underwhelmed, even -10 is a surprisingly small reduction and I never use the other two. Master volume on the other hand gives you a massive range and I seldom turn it up above half way, even at the garage days jams. Almost all of the clips I've posted on the group have the master set to less than 20% with kids sleeping in the next room. That said, the 10% attenuator is an easy mod and does give an extra option if you want to drive those output tubes a little harder. Just remember that those 25W resistors need a heat sink (chassis works well), I completely missed that at first. Yeti Awesome, looking forward to watching this build. Out of interest, where are planning to get your reverb tank? as well as all the Valves and Valve sockets. That is so far what I've sourced..
also going to need to do the Pedal for it, which should be fairly simple from what i understand, basically just 2 switches. While I was working on my amp last night I remembered this excellent article on grounding and thought you might be interested. Unfortunately I don't have a link for it and don't even know where it is from because I'd love to read the rest of the book. I followed it's advice and used a star grounding scheme and I'm pretty sure that it is a major reason that my amp is nice and quiet... or at least was before my mod... holding thumbs it remains that way. Yeti Unfortunately I don't have a link for it and don't even know where it is from because I'd love to read the rest of the book. I’ve found it! Turns out it’s one of the sites I linked to in an earlier post (although that isn’t where I got it). Trying to get hold of the book but it doesn’t seem to be available as an ebook. will definitely give it a read. since we are sharing, here are a few i have collected. 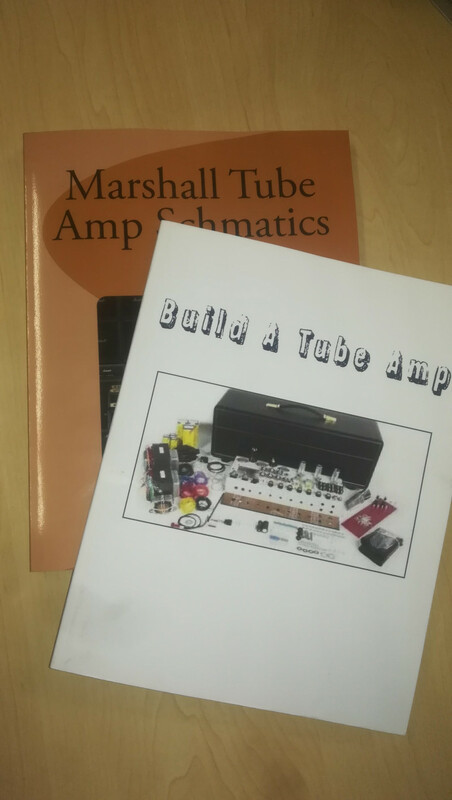 So today my books arrived..
so the one is as I predicted, just a book filled with marshall amp schematics..
thanks will definetly keep that in mind..
@tedibear Drop me a email. brj217@gmail.com. I might have something for you that will interest you. tedibear Fair enough, let me know what you find. I'm only planning on using this right at the very front end of the amp where there is almost no current so 22ga should be ample for my needs. In the meantime I see Takelot has a copy for sale..which I might just get next month..